Even the most pumped up and positive ones of us find ourselves broken and weary at some point in our life. It isn't so hard to believe and follow Jesus when we are soaring on the wings of eagles or running and not getting weary in our walk with God. Often the toughest time to keep our faith vibrant is when we are trying to keep putting one foot in front of the other while not fainting. In those moments of absolute powerlessness, weakness, and brokenness the Lord is often most real, most powerful, and most present. Thank you, God, for sustaining me and keeping my faith alive when I have been under attack from the Evil One and have grown weary with the challenges and hardships of life. 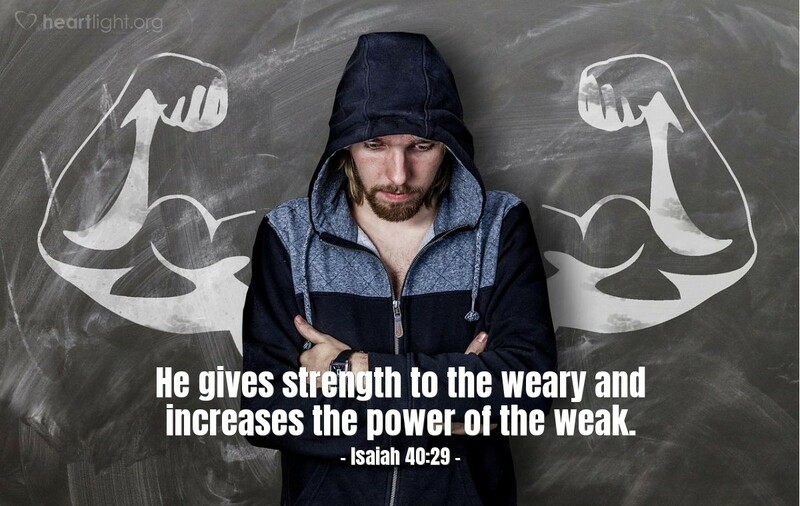 Please give those I love, and mention now by name, the strength to press on even though they are weary and weak. Please be real in their lives and let them know that you are coming with grace to help and redeem as their Great Deliverer. In Jesus' name I ask it. Amen.